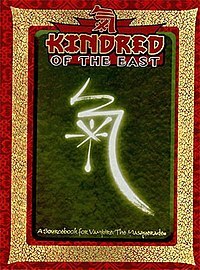 As I said, I will be talking about this roleplaying rulebook called Kindred of the East (KotE) and I have. But first, I made a mistake in saying that KotE dealt in South Asia. I was misremembering but for any South Asian readers, despair not! White Wolf already covered the region, or at least just India, in the main Vampire: The Masquerade books. You get the Ravnos clan which are basically Indian vampires organised into the Hindu caste system and whose western brethren are stereotypes of Roma people. The Ravnos was also originally written as just stereotypes of Roma people, complete with the clan nickname “Gypsies”. And White Wolf also once released Gypsies, where Roma people are more magic than even vampires and werewolves. Then you also have the fanatical Muslim assassin Assamite vampires. As for vampires in Africa, well, I would be making a complete arse of myself talking about cultures which I have nearly no familiarity with. But looking at their track record so far… The title is Kindred of the Ebony Kingdom for anyone curious, by the way. So after saying all that, how well do you think KotE would fare?